A fun family event coming once again to Chicago. If you haven’t heard . . . the tall ships are returning. At Navy Pier you can enjoy these spectacular boats at the Taste of Tall Ships, August 11-14, from 10 am to 9 pm most days. That page will take you to info on each of the ships and some of the scheduled events. Some are just for looking at and some you can get on, and some you can enjoy a ride on. You can board the Pride of Baltimore II & Flagship Niagara. Group rates available as well if you get a group of 20 or more. That will knock a buck of each pass. While on the subject of tall ships . 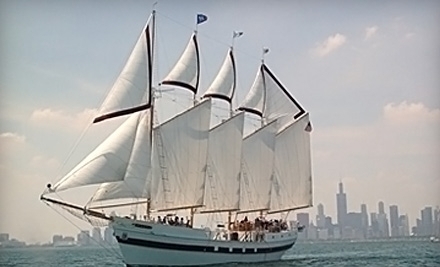 . .
Today Groupon has a special deal as well for a ride on Chicago’s own tall ship, Windy. THE GROUPON IS NOT VALID DURING TASTE OF TALL SHIPS. But, you can enjoy this ride some other day and avoid the crowds of the tall ships. Or, you can do a unit on tall ships and start and end it with two different tall ship events. The I’m All In giveaway . . .
One of my all time favorite things to do here is give things away, and since I don’t do it all that often, I savor it. Thank you to those of you who entered, but unfortunately only one can win. Since we had 6 entrants I figured I would let a roll of the die choose the winner. And, the new winner is . . . Thanks, again, to everyone that entered! This time of year finds lots of stores hosting teacher appreciation events, and of course homeschool teachers will want to enjoy these as well. Office Depot’s Annual Teacher Appreciation Breakfast events are held at Office Depot retail stores across North America and are designed to provide a venue for teachers to network and prepare for the upcoming school year. More than 100,000 teachers are expected to attend. Office Depot is celebrating our Star Teachers with a spectacular day of savings and special treatment! As our guest, you will enjoy breakfast, 10% off purchases (exceptions provided if asked), and a tote bag filled with gifts. Take advantage of this exciting event to stock up on all the classroom materials you’ll need in the fall. Our friendly and knowledgeable staff will be on hand to make sure you find the best supplies you need to succeed. The Office Depot Star Teacher Program is open to Pre-K through 12th Grade classroom teachers. Office Max will be thanking teachers starting this coming weekend on July 31 and August 1. MaxPerks members receive free reuseable bag with a 20% discount for everything you can fit in it. More giveaways and gifts as well while they last. More information on their site, just click here. Saturday, August 13, 2011is Big Lots’ Teacher Appreciation Day. They want to thank America’s teachers and educators for their hard work and devotion.That’s why they have designated August 13, 2011 as Big Lots Teacher Appreciation Day. Check out special discounts just for educators on that day. Don’t forget to call ahead to confirm dates and offers at your local store. And, don’t forget your homeschool ID card to verify your status as a homeschooler. Thanks to Frugal Penny for the heads up. Six Flags hosts the 16th annual Home School Day event on August 18. Enjoy a fun filled day at the park with your family and friends. A special all-you-can-eat Home School Day picnic is also available in our private picnic grove. Contact SFGAMspecialevents@sixflags.com for additional information. Six Flags Great America is excited to announce Catholic Family Day on Sunday, August 14th. Enjoy a fun filled day with your family and friends at Six Great America and Six Flags Hurricane Harbor. In the evening join us for Mass in our Southwest Amphitheatre sponsored by the Young Adult Ministry Office – Archdiocese of Chicago. Please contact SFGAMspecialevents@sixflags.com for more information. Six Flags Great America and the Autism Society of Illinois are proud to announce the Second Annual Autism Awareness Day. More details on this event and special discounted tickets on the AutismIllinois site. Six Flags Great America is not only the entertainment capital of the world but also a unique outdoor learning lab. We have designed specific learning materials for both students and teachers that gives experiential learning a new meaning. Let Six Flags be your outdoor learning lab and use the free materials below to plan lessons and make learning fun. Whether it’s calculating (or experiencing) the velocity of the America Eagle or learning how an entertainment giant like Six Flags markets themselves. Don’t forget to use your Reading Reward free tickets before they expire. We just enjoyed the day there yesterday and it was once again a great incentive for my kids. They look forward to it every year. Please forward this message to friends and colleagues! To register or for more information about these events, go to www.excellenceinwriting.com/IL2011 or call 800-856-5815. A day of workshops for students Grades 3–10, new to the IEW writing program. Cost: $20.00 per student per workshop. Teachers & Parents may observe at no cost. The Introductory Student Workshops are enjoyable, informative and motivating for the children who attend, but they are also meant to serve as demonstration classes. Parents are encouraged to remain in the room, observing and participating with their child. Please make arrangements for the care of non-enrolled siblings. Please register early as theseworkshops fill fast. Sorry, no enrollment accepted at the door for Student Workshops. Get immediate experience and inside tips on how to do your best on the SAT or ACT essay. Also includes strategies for composing the college application personal essay. Andrew Pudewa will be a speaker! We will also have a booth, so please stop by.